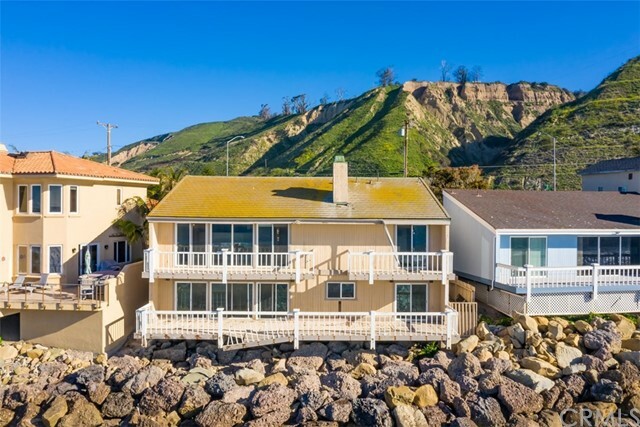 All Ventura homes currently listed for sale in Ventura as of 04/25/2019 are shown below. You can change the search criteria at any time by pressing the 'Change Search' button below. "An amazing Ventura Keys waterfront home with a magic combination of a luxurious custom-built house and a fabulous location on the main channel and magnificent views of the water, the hills and evening sunsets. Boaters will appreciate the large turning basin and proximity to the harbor entrance.This two-story house spans about 4,672 square feet of interior space and 1,200 square feet of outdoor space on the waterfront deck. There are four bedrooms, five and a half baths, and an elevator. The large living room covers the entire width of the first floor and includes a fireplace, a sunken bar and floor to ceiling glass doors which lead to the deck. There is a formal dining room, also with water views. The Chef's kitchen top-of-the-line appliances. On the second floor is the luxurious master suite with wall to wall glass windows, his and her bathrooms, a fireplace, a large sitting area. There are two ensuite bedrooms, a study and a laundry room on the second level.Enjoy the outdoors on the wonderful deck overlooking the water, with a ramp leading to your 52-foot boat dock. Walk to restaurants, the harbor, and shops, or ride your bike along miles of coastal paths. Your opportunity to enjoy coastal living at its finest!" "Location, Location, Location. This Ventura Keys custom home is the embodiment of an old real estate adage. Situated on one of the best and largest lots on ''The Island'', this home has features for the most discerning buyer. Enter the property through the private courtyard that guides you to an open entry flanked by a half bath, dining room, and living room complete with wet bar and fireplace. The kitchen opens out to the sunken family room also complete with fireplace. All lower level rooms open out to the cantilevered deck and channel view. The second level features three bedrooms including the spacious master that all face the channel and open to a balcony. The master, complete with fireplace, features breathtaking views and a generous master bath. Completing the upper level is the great room that can play host to many a family gathering, work space, or media room. As you work your way outside the real treasure of this property is revealed -- a mammoth-sized patio with two water features and built-in BBQ that overlooks a rarely offered 70' private boat dock. Plenty of room for both large and smaller vessels alike. Minutes from Pierpont Beach, the Ventura Marina, and Downtown Ventura. Call for a private showing appointment today." "Gorgeous Ventura Keys water view home with a 35ft dock and a beautiful new deck.Perfect for kayaking, paddle boarding, or a sunset cruise. This home has 3 bedrooms, 3 baths and a garden room. The updated kitchen, living room, and dining area has a beautiful view of the channel. The upstairs bedrooms have balconies for sunrise, sunset or just relaxing on the channel. Air conditioning and heating upstairs with a separate heater downstairs. Close to the beach, shopping, restaurants and excellent schools." "Enjoy breath taking sunset views in your very own Mussel Shoals Beach Cottage. Wake up to the sound of the ocean and enjoy watching the surf at 'Little Rincon' from your livingroom. Explore the tide pools at low tide or go up the beach for a beach walk. Finish your day watching the sunset. This home is all about the beach lifestyle. Conveniently located almost midway between Santa Barbara and Ventura and just minutes to Carpinteria. In addition there is a wonderful bike path that hugs the coastline." "Impressive Mediterranean 2 story home built in 2018, located at the end of a quiet Cul-de-Sac in the hills of Ventura. 3642 square foot, 4 Bedroom, 4 Bath, Den/Office, Family Room & 3 Car Garage located on a 10,000 sq.ft. Home-site. Carefully designed open floor-plan perfect for entertaining and day to day living. Gourmet Kitchen with walk-in pantry. Viking Appliances, Quartz Counter-Tops Cabinets with soft close and under cabinet lighting. Master Retreat, over-sized bathroom with deep soaking tub and spacious shower, his and her separate vanities & walk-in closet. High End Interior finishes and beautiful ocean views makes this home a great value and investment."